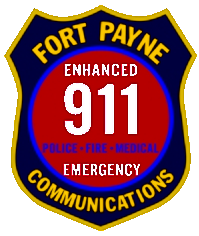 The City of Fort Payne e911 Communications system operates, and is supervised, as a division of the Fort Payne Police Department. The e911 Communications Center handles all 911 emergency calls for assistance within the City of Fort Payne. The Center handles all police (845-1414) and fire rescue (845-1234) calls for service or information as well as medical calls for service within the City of Fort Payne. The Center dispatches for the Fort Payne Police Department and the Fort Payne Fire Rescue Department. Medical calls are transferred to the Dekalb Ambulance Service for dispatch. Calls for other services are transferred to other agencies as is necessary. The City of Fort Payne e911 Communications Center coordinates closely with the Dekalb County 911 Communications Center, the Dekalb Ambulance Service, and other surrounding state, county, and local agencies or departments in an attempt to offer the best service possible to the public. The Center is responsible for issuing Burn Permits (845-1234) as regulated by the Fire Rescue Department. The 911 Center is also charged with the responsibility of addressing for the City of Fort Payne. Persons needing an address must call 845-1272 to obtain an address.